Other caterpillars of moths and butterflies that gardeners may find in their vegetables. The Small White is common throughout much of the British Isles, Europe and large parts of the sub tropical world. In the British Isles they are double brooded flying between March and October. Numbers can be swollen by migrants from the continent particularly in July and August. 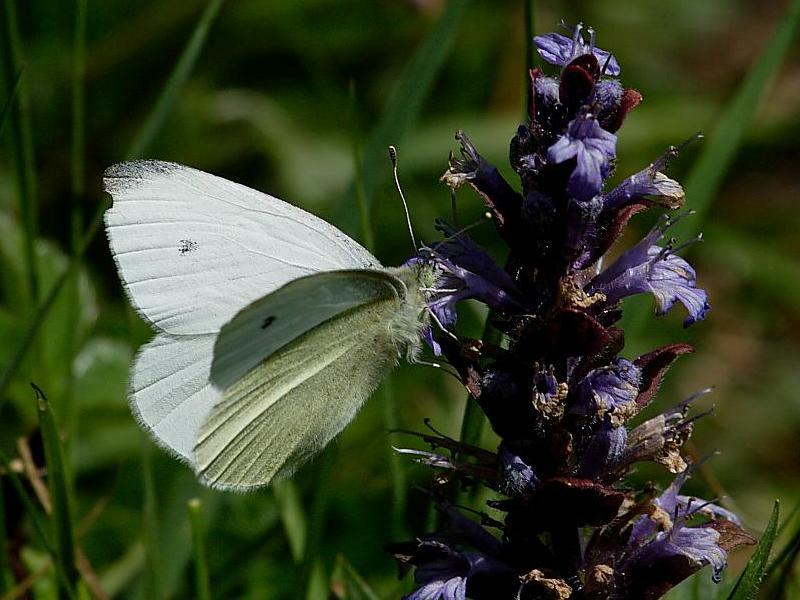 The Small White has a wingspan of up to 45mm and is best identified from the Large White by its smaller size and reduced black on the tips of the forewing. The males generally have a single black spot on the upper surface of the forewing and two on the underside. Although the single spot on the upper side of the forewing is sometimes absent on first generation butterflies. The females have two black spots on both sides of the forewings. 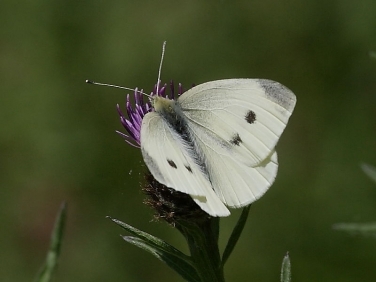 The Small White Butterfly is best identified from the similar sized Green-veined White by the lack of dark veining on both the upper and underside of the wings. It can also be misidentified for The female Orange-tip Butterfly which is also commonly seen in garden. Both male and female second generation butterflies are generally larger and more boldly marked. Butterflies may often be seen nectaring on a wide variety of flowers, including buddleia, dandelions and the purple heads of knapweed. 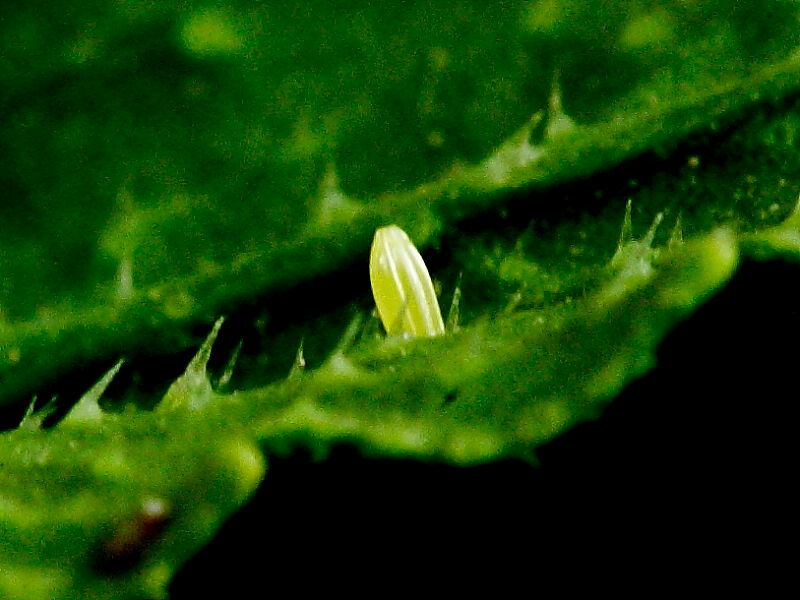 Eggs are laid singly by the female during the day on the underside of brassicas, wild and cultivated crucifers and Nasturtiums. The cone shaped eggs are pale at first but soon turn yellower. 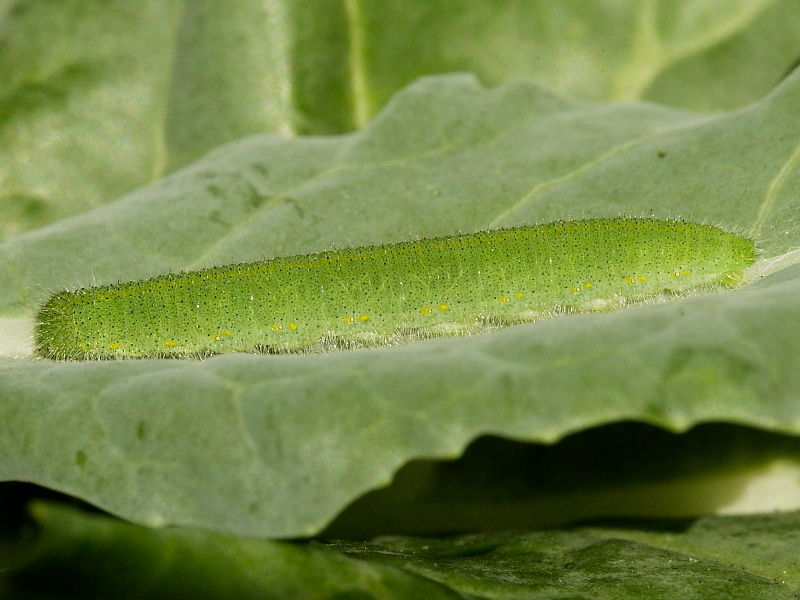 Despite being only 1mm high they are still quite easily spotted against the green leaves of the larval food plant. The eggs hatch within 3-10 days depending on temperature. The caterpillars of the Small White are 2mm long and pale yellow with ochreous heads when first hatching. 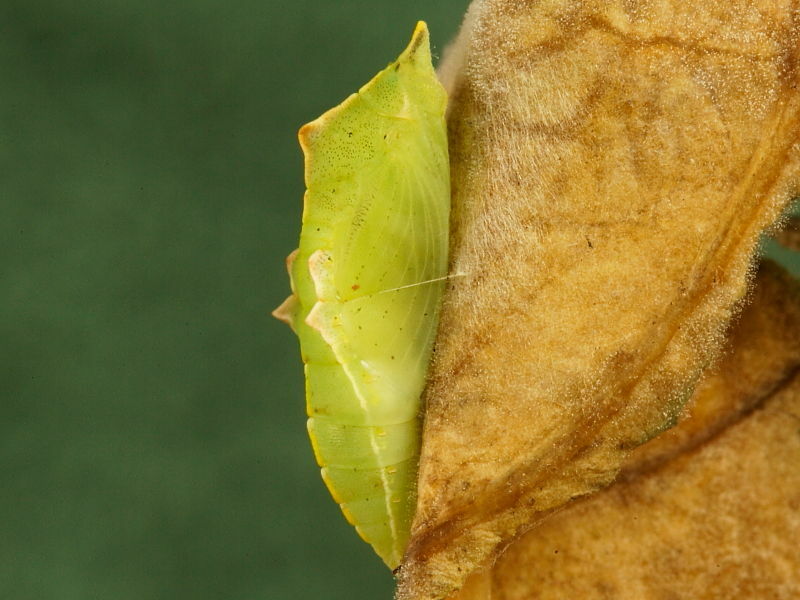 They turn progressively greener with each instar and when fully grown, after 3 weeks, are 25mm long with a green head and body that are covered in short white hairs. A faint yellow dorsal line and a broken row of yellow marks following the spiracular line are key identification markings. The caterpillar of the Green-veined White is very similar but lacks the yellow dorsal line and has a single yellow spot encircling the spiracles. 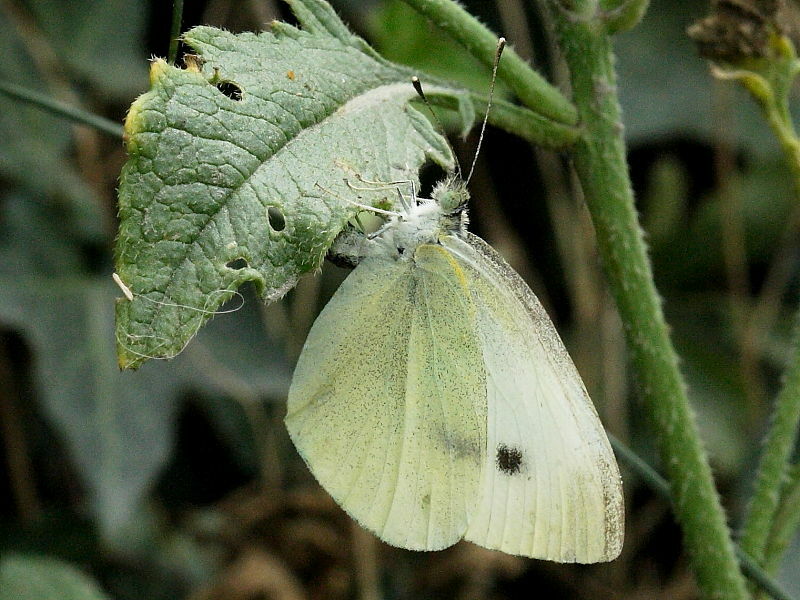 Although both butterflies lay eggs on cruciferous plants in the wild the Green-veined White is less attracted to cultivated varieties. 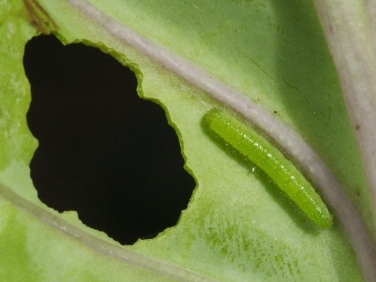 When fully grown the caterpillars stop feeding and leave the food plant to look for a suitable place to pupate. The caterpillars find a sheltered place such as a tree trunk or the wall of a shed and secure their chrysalis using a silk pad and girdle. Butterflies from early broods will emerge within twenty days while later broods will over winter as a chrysalis, emerging in March or April. 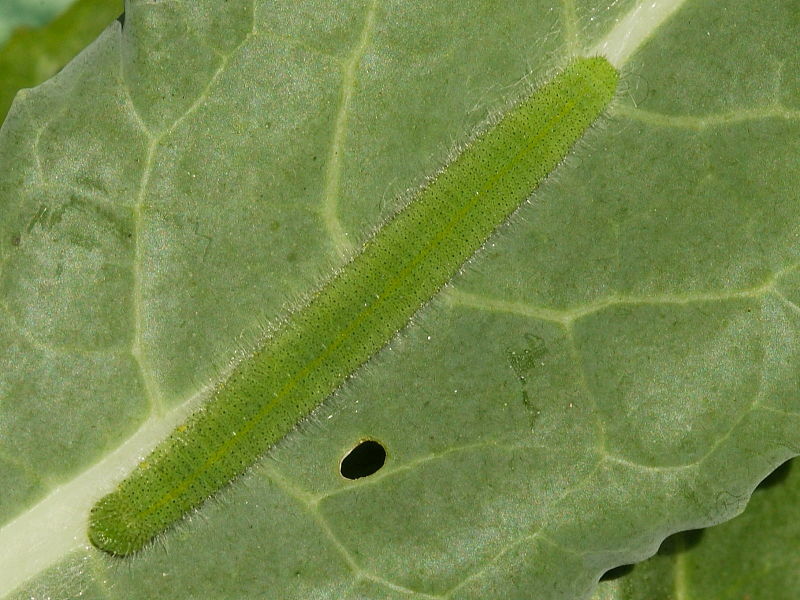 Small White caterpillars are a major pest of the brassica crops of farmers and vegetable gardeners. At first, small holes will appear in leaves but the most severe damage may occur later when the caterpillar feeds within the crown of the vegetable. 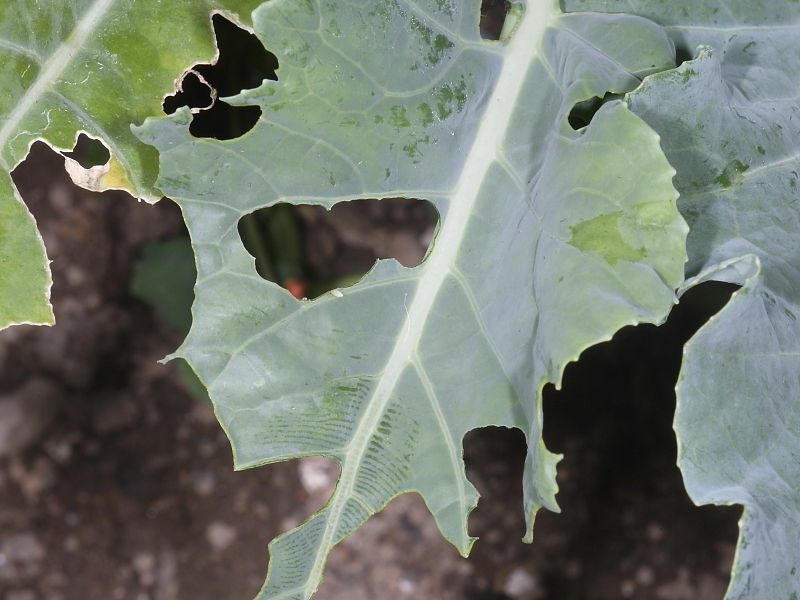 Brassicas can be protected with the same 1 inch diameter netting used to prevent the Large White Butterfly from laying eggs. This is the most environmentally friendly and less labour intensive way of safeguarding brassicas. The single eggs and caterpillars are less easily found than those of the Large White and so picking them off is both more time consuming and not as effective. Should environmentally friendly preventative methods be impractical then it is recommended that care should be taken in choosing an insecticide. There are several vegetable spray treatments available based on natural products that are worth considering. Many insects are beneficial in helping to control other pest species. They are also an important part of the food chain for other animals, some of which such as birds play an important part in controlling slugs, snails and other caterpillar vegetable pests.